- Publisher Does the Bible really answer some of life's most difficult questions? How does God provide direction to the common issues that we face? We live in a world where we all have to deal with the realities of stress, failure, crises, loneliness and change. In this six-session DVD study, renowned pastor and bestselling author Rick Warren takes you inside the Bible to discover answers to six of life's toughest questions. Drawing from the examples of different biblical characters who faced the same issues, Warren offers concise, practical insights you can understand and apply in order to move past everyday struggles and experience a life of purpose, peace and significance. Life's difficult questions do have answers. Answers from the Bible that can change your outlook -- and your life. The God's Answers to Life's Difficult Questions Study Guide will help you fully engage with the six-session group DVD study. The six DVD session titles include: Session One: How Can I Cope with Stress? Session Two: How Can I Rebound from Failure? Session Three: How Can I Be Confident in a Crisis? Session Four: How Can I Live Above Average? Session Five: How Can I Overcome Loneliness? Session Six: How Can I Ever Change? [Thumbnail DVD image] Designed for use with the God's Answers to Life's Difficult Questions DVD. About "God's Answers to Life's Difficult Questions (Study Guide)"
Does the Bible really answer some of life's most difficult questions? How does God provide direction to the common issues that we face? We live in a world where we all have to deal with the realities of stress, failure, crises, loneliness and change. In this six-session DVD study, renowned pastor and bestselling author Rick Warren takes you inside the Bible to discover answers to six of life's toughest questions. Drawing from the examples of different biblical characters who faced the same issues, Warren offers concise, practical insights you can understand and apply in order to move past everyday struggles and experience a life of purpose, peace and significance. Life's difficult questions do have answers. Answers from the Bible that can change your outlook -- and your life. The God's Answers to Life's Difficult Questions Study Guide will help you fully engage with the six-session group DVD study. The six DVD session titles include: Session One: How Can I Cope with Stress? Session Two: How Can I Rebound from Failure? Session Three: How Can I Be Confident in a Crisis? Session Four: How Can I Live Above Average? Session Five: How Can I Overcome Loneliness? Session Six: How Can I Ever Change? 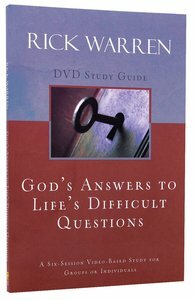 [Thumbnail DVD image] Designed for use with the God's Answers to Life's Difficult Questions DVD.